Here in New Mexico, we’re rich in chiles of all kinds. However, I seldom see or hear about one of the best, the Spanish Pimiento de Padron. In northern Spain, there’s a festival devoted to them when they come into season. The peppers are picked green, when about the size of large olives, and saute’ed whole in olive oil with some sea salt, then eaten hot as a tapa. About one in 8-10 is fiery hot, while the rest are pretty mild. Eating them is called Spanish Roulette, but we New Mexicans are up to it. 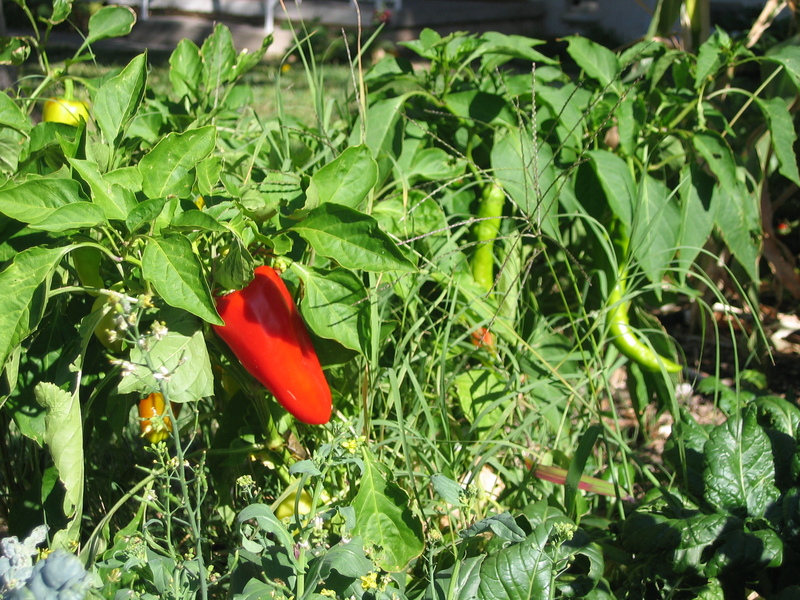 After a summer of chowing down the green ones, I let the last flush turn red and dry on the plant, and make my year’s supply of wonderfully flavorful red pepper. 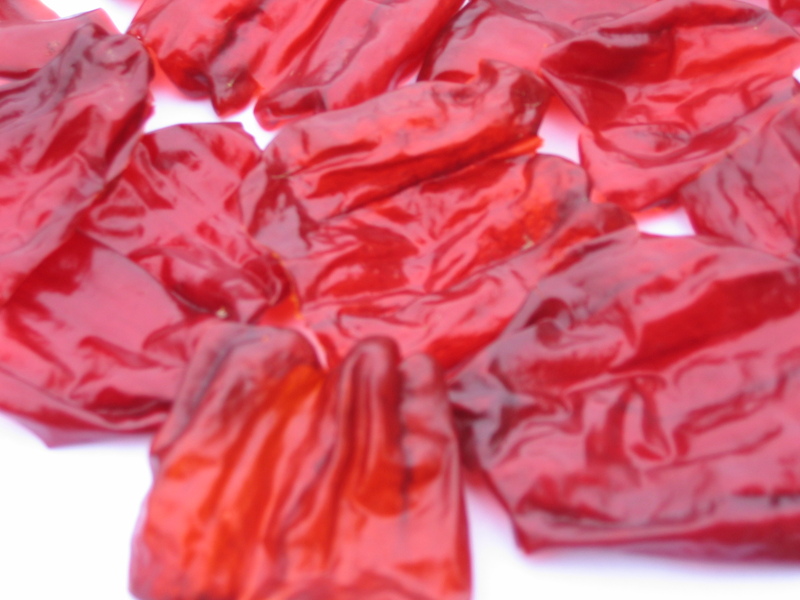 I pick the somewhat dry, leathery peppers and slit each one open, lay it flat, and remove all the stem, seeds and veins. The sensitive will want to wear latex gloves for this. Spread them out in single layers on one or two large baking sheets and dry them in a very slow oven, 170 degrees if possible. Drying time varies with weather conditions and oven temp. Usually I dry them at 170 for about 4 hours, then leave them in the turned-off oven overnight. When dry, they are shiny and translucent and look like Chinese enamel; see above. Grind them to a powder in the blender and keep them in an airtight container until you need them. I keep a shaker of “yard pepper” on my dining room table, and love the way it adds snap and piquancy to a variety of foods. try it on fried eggs. The plants are very attractive, about 3′ high at maturity and fairly compact, so I like to grow them where they can be seen. You can get seeds at our New Mexico source, Gourmet Seeds.